How can I review store orders? How can I filter for specific Store Orders? You can use the following filters to bring up a list of members with pending store orders or those without pending store orders. Once you select the filters you would like, click Find to apply the filters. If you want to see a list of all pending store orders, click Reset Filters and then click Find. 4. Flags: Filter for all members with a specific Flag. Flags can be added under the Contact Info tab of a member account in the dashboard. How do I Export and Email Members With Store Orders? Just like with subscriptions, you can export and email members who have a store order. 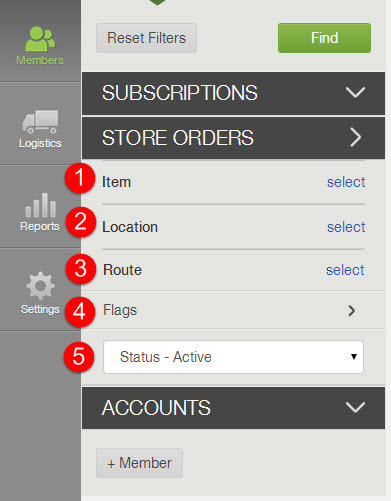 To email members with store orders, click the Email Members button in the upper right corner. If you have filters applied, the email will only be sent to the members listed in the results from the applied filters. You can either type an email directly or use one of your previously created templates. Reminding members that they can add items from your store to their subscription is a good way to kick-start higher participation from existing members. We recommend sending an email to all of your members who have not placed a store order. You can use the Status - Not Submitted filter to easily pull a list of these members. Then, click the email members button in the upper right hand corner.